Soak, wash, sanitize, and rinse all your dirty dishes in one unit with one of our 4 compartment sinks. Designed for busy dishwashing rooms and the toughest cleaning tasks, these sinks allow one dishwasher or a team of dishwashers to clean soiled pots, pans, kitchen utensils, dinnerware, glassware, and flatware with one self-contained sink unit. Efficiency is key in the dishwahing room, and a large sink with multiple compartments affords greater versatility to get the job done. Choose a commercial utility sink with convenient features like rolled edges to contain splashes, adjustable plastic feet, and pre-drilled holes to accommodate faucet installation. Our 4 compartment sinks are constructed out of sturdy and durable stainless steel in different gauges that limit corrosion. Several models also offer one or two drainboards for drying clean dishware. Covered corners allow for easy cleaning. Advance Tabco 9-24-80 Super Saver Four Compartment Pot Sink - 97"
Good - The Advance Tabco 9-24-80 Super Saver 97" four compartment pot sink is made of 18 gauge 304 stainless steel for durability and a professional appearance. Complete with (4) 12" deep bowls and an 8" backsplash, this pot sink features welded stainless steel cross-bracing on the sides for stability. Advance Tabco 93-24-80 Regaline Four Compartment Stainless Steel Sink - 97"
Better - The Advance Tabco 93-24-80 Regaline 97" four compartment pot sink is made of 16 gauge 304 stainless steel for increased durability and a professional appearance. Complete with (4) 12" deep bowls and an 8" backsplash, this pot sink features welded stainless steel cross-bracing on the sides for stability. Advance Tabco 94-24-80 Spec Line Four Compartment Pot Sink - 97"
Best - The Advance Tabco 94-24-80 Spec-Line 97" four compartment pot sink is made of 14 gauge 304 stainless steel for enhanced durability and a heavy-duty professional appearance. Complete with (4) 14" deep bowls and an 11" backsplash, this pot sink features welded stainless steel cross-bracing on the front, rear, and sides for increased stability. Advance Tabco 9-24-80-18RL Super Saver Four Compartment Pot Sink with Two Drainboards - 126"
Good - The Advance Tabco 9-24-80-18RL Super Saver 126" four compartment pot sink is made of 18 gauge 304 stainless steel for durability and a professional appearance. Complete with (4) 12" deep bowls, an 8" backsplash, and (2) 18" drainboards, this pot sink features welded stainless steel cross-bracing on the sides for stability. Advance Tabco 93-24-80-18RL Regaline Four Compartment Stainless Steel Sink with Two Drainboards - 126"
Better - The Advance Tabco 93-24-80-18RL Regaline 126" four compartment pot sink is made of 16 gauge 304 stainless steel for increased durability and a professional appearance. Complete with (4) 12" deep bowls, an 8" backsplash, and (2) 18" drainboards, this pot sink features welded stainless steel cross-bracing on the sides for stability. Advance Tabco 94-24-80-18RL Spec Line Four Compartment Pot Sink with Two Drainboards - 126"
Best - The Advance Tabco 94-24-80-18RL Spec-Line 126" four compartment pot sink is made of 14 gauge 304 stainless steel for enhanced durability and a heavy-duty professional appearance. Complete with (4) 14" deep bowls, an 11" backsplash, and (2) 18" drainboards, this pot sink features welded stainless steel cross-bracing on the front, rear, and sides for increased stability. Advance Tabco 9-24-80-24RL Super Saver Four Compartment Pot Sink with Two Drainboards - 138"
Good - The Advance Tabco 9-24-80-24RL Super Saver 138" four compartment pot sink is made of 18 gauge 304 stainless steel for durability and a professional appearance. Complete with (4) 12" deep bowls, an 8" backsplash, and (2) 24" drainboards, this pot sink features welded stainless steel cross-bracing on the sides for stability. Advance Tabco 93-24-80-24RL Regaline Four Compartment Stainless Steel Sink with Two Drainboards - 138"
Better - The Advance Tabco 93-24-80-24RL Regaline 138" four compartment pot sink is made of 16 gauge 304 stainless steel for increased durability and a professional appearance. Complete with (4) 12" deep bowls, an 8" backsplash, and (2) 24" drainboards, this pot sink features welded stainless steel cross-bracing on the sides for stability. Advance Tabco 94-24-80-24RL Spec Line Four Compartment Pot Sink with Two Drainboards - 138"
Best - The Advance Tabco 94-24-80-24RL Spec-Line 138" four compartment pot sink is made of 14 gauge 304 stainless steel for enhanced durability and a heavy-duty professional appearance. Complete with (4) 14" deep bowls, an 11" backsplash, and (2) 24" drainboards, this pot sink features welded stainless steel cross-bracing on the front, rear, and sides for increased stability. Advance Tabco 9-24-80-36RL Super Saver Four Compartment Pot Sink with Two Drainboards - 162"
Good - The Advance Tabco 9-24-80-36RL Super Saver 162" four compartment pot sink is made of 18 gauge 304 stainless steel for durability and a professional appearance. Complete with (4) 12" deep bowls, an 8" backsplash, and (2) 36" drainboards, this pot sink features welded stainless steel cross-bracing on the sides for stability. Advance Tabco 93-24-80-36RL Regaline Four Compartment Stainless Steel Sink with Two Drainboards - 162"
Better - The Advance Tabco 93-24-80-36RL Regaline 162" four compartment pot sink is made of 16 gauge 304 stainless steel for increased durability and a professional appearance. Complete with (4) 12" deep bowls, an 8" backsplash, and (2) 36" drainboards, this pot sink features welded stainless steel cross-bracing on the sides for stability. Advance Tabco 94-24-80-36RL Spec Line Four Compartment Pot Sink with Two Drainboards - 162"
Best - The Advance Tabco 94-24-80-36RL Spec-Line 162" four compartment pot sink is made of 14 gauge 304 stainless steel for enhanced durability and a heavy-duty professional appearance. Complete with (4) 14" deep bowls, an 11" backsplash, and (2) 36" drainboards, this pot sink features welded stainless steel cross-bracing on the front, rear, and sides for increased stability. Advance Tabco 9-44-96 Super Saver Four Compartment Pot Sink - 113"
Good - The Advance Tabco 9-44-96 Super Saver 113" four compartment pot sink is made of 18 gauge 304 stainless steel for durability and a professional appearance. Complete with (4) 12" deep bowls and an 8" backsplash, this pot sink features welded stainless steel cross-bracing on the sides for stability. Advance Tabco 93-44-96 Regaline Four Compartment Stainless Steel Sink - 113"
Better - The Advance Tabco 93-44-96 Regaline 113" four compartment pot sink is made of 16 gauge 304 stainless steel for increased durability and a professional appearance. Complete with (4) 12" deep bowls and an 8" backsplash, this pot sink features welded stainless steel cross-bracing on the sides for stability. Advance Tabco 94-44-96 Spec Line Four Compartment Pot Sink - 113"
Best - The Advance Tabco 94-44-96 Spec-Line 113" four compartment pot sink is made of 14 gauge 304 stainless steel for enhanced durability and a heavy-duty professional appearance. Complete with (4) 14" deep bowls and an 11" backsplash, this pot sink features welded stainless steel cross-bracing on the front, rear, and sides for increased stability. Advance Tabco 9-44-96-24RL Super Saver Four Compartment Pot Sink with Two Drainboards - 154"
Good - The Advance Tabco 9-44-96-24RL Super Saver 154" four compartment pot sink is made of 18 gauge 304 stainless steel for durability and a professional appearance. Complete with (4) 12" deep bowls, an 8" backsplash, and (2) 24" drainboards, this pot sink features welded stainless steel cross-bracing on the sides for stability. Advance Tabco 93-44-96-24RL Regaline Four Compartment Stainless Steel Sink with Two Drainboards - 154"
Better - The Advance Tabco 93-44-96-24RL Regaline 154" four compartment pot sink is made of 16 gauge 304 stainless steel for increased durability and a professional appearance. Complete with (4) 12" deep bowls, an 8" backsplash, and (2) 24" drainboards, this pot sink features welded stainless steel cross-bracing on the sides for stability. Advance Tabco 94-44-96-24RL Spec Line Four Compartment Pot Sink with Two Drainboards - 154"
Best - The Advance Tabco 94-44-96-24RL Spec-Line 154" four compartment pot sink is made of 14 gauge 304 stainless steel for enhanced durability and a heavy-duty professional appearance. Complete with (4) 14" deep bowls, an 11" backsplash, and (2) 24" drainboards, this pot sink features welded stainless steel cross-bracing on the front, rear, and sides for increased stability. Advance Tabco 9-44-96-36RL Super Saver Four Compartment Pot Sink with Two Drainboards - 178"
Good - The Advance Tabco 9-44-96-36RL Super Saver 178" four compartment pot sink is made of 18 gauge 304 stainless steel for durability and a professional appearance. Complete with (4) 12" deep bowls, an 8" backsplash, and (2) 36" drainboards, this pot sink features welded stainless steel cross-bracing on the sides for stability. Advance Tabco 93-44-96-36RL Regaline Four Compartment Stainless Steel Sink with Two Drainboards - 178"
Better - The Advance Tabco 93-44-96-36RL Regaline 178" four compartment pot sink is made of 16 gauge 304 stainless steel for increased durability and a professional appearance. Complete with (4) 12" deep bowls, an 8" backsplash, and (2) 36" drainboards, this pot sink features welded stainless steel cross-bracing on the sides for stability. Advance Tabco 94-44-96-36RL Spec Line Four Compartment Pot Sink with Two Drainboards - 178"
Best - The Advance Tabco 94-44-96-36RL Spec-Line 178" four compartment pot sink is made of 14 gauge 304 stainless steel for enhanced durability and a heavy-duty professional appearance. Complete with (4) 14" deep bowls, an 11" backsplash, and (2) 36" drainboards, this pot sink features welded stainless steel cross-bracing on the front, rear, and sides for increased stability. Advance Tabco 9-4-72 Super Saver Four Compartment Pot Sink - 81"
Good - The Advance Tabco 9-4-72 Super Saver 81" four compartment pot sink is made of 18 gauge 304 stainless steel for durability and a professional appearance. Complete with (4) 12" deep bowls and an 8" backsplash, this pot sink features welded stainless steel cross-bracing on the sides for stability. Advance Tabco 93-4-72 Regaline Four Compartment Stainless Steel Sink - 81"
Better - The Advance Tabco 93-4-72 Regaline 81" four compartment pot sink is made of 16 gauge 304 stainless steel for increased durability and a professional appearance. Complete with (4) 12" deep bowls and an 8" backsplash, this pot sink features welded stainless steel cross-bracing on the sides for stability. Advance Tabco 94-4-72 Spec Line Four Compartment Pot Sink - 81"
Best - The Advance Tabco 94-4-72 Spec-Line 81" four compartment pot sink is made of 14 gauge 304 stainless steel for enhanced durability and a heavy-duty professional appearance. Complete with (4) 14" deep bowls and an 11" backsplash, this pot sink features welded stainless steel cross-bracing on the front, rear, and sides for increased stability. Advance Tabco 9-4-72-18RL Super Saver Four Compartment Pot Sink with Two Drainboards - 110"
Good - The Advance Tabco 9-4-72-18RL Super Saver 110" four compartment pot sink is made of 18 gauge 304 stainless steel for durability and a professional appearance. Complete with (4) 12" deep bowls, an 8" backsplash, and (2) 18" drainboards, this pot sink features welded stainless steel cross-bracing on the sides for stability. Advance Tabco 93-4-72-18RL Regaline Four Compartment Stainless Steel Sink with Two Drainboards - 110"
Better - The Advance Tabco 93-4-72-18RL Regaline 110" four compartment pot sink is made of 16 gauge 304 stainless steel for increased durability and a professional appearance. Complete with (4) 12" deep bowls, an 8" backsplash, and (2) 18" drainboards, this pot sink features welded stainless steel cross-bracing on the sides for stability. Advance Tabco 94-4-72-18RL Spec Line Four Compartment Pot Sink with Two Drainboards - 110"
Best - The Advance Tabco 94-4-72-18RL Spec-Line 110" four compartment pot sink is made of 14 gauge 304 stainless steel for enhanced durability and a heavy-duty professional appearance. Complete with (4) 14" deep bowls, an 11" backsplash, and (2) 18" drainboards, this pot sink features welded stainless steel cross-bracing on the front, rear, and sides for increased stability. Advance Tabco 9-4-72-24RL Super Saver Four Compartment Pot Sink with Two Drainboards - 122"
Good - The Advance Tabco 9-4-72-24RL Super Saver 122" four compartment pot sink is made of 18 gauge 304 stainless steel for durability and a professional appearance. Complete with (4) 12" deep bowls, an 8" backsplash, and (2) 24" drainboards, this pot sink features welded stainless steel cross-bracing on the sides for stability. Advance Tabco 93-4-72-24RL Regaline Four Compartment Stainless Steel Sink with Two Drainboards - 122"
Better - The Advance Tabco 93-4-72-24RL Regaline 122" four compartment pot sink is made of 16 gauge 304 stainless steel for increased durability and a professional appearance. Complete with (4) 12" deep bowls, an 8" backsplash, and (2) 24" drainboards, this pot sink features welded stainless steel cross-bracing on the sides for stability. Advance Tabco 94-4-72-24RL Spec Line Four Compartment Pot Sink with Two Drainboards - 122"
Best - The Advance Tabco 94-4-72-24RL Spec-Line 122" four compartment pot sink is made of 14 gauge 304 stainless steel for enhanced durability and a heavy-duty professional appearance. Complete with (4) 14" deep bowls, an 11" backsplash, and (2) 24" drainboards, this pot sink features welded stainless steel cross-bracing on the front, rear, and sides for increased stability. Advance Tabco 9-4-72-36RL Super Saver Four Compartment Pot Sink with Two Drainboards - 146"
Good - The Advance Tabco 9-4-72-36RL Super Saver 146" four compartment pot sink is made of 18 gauge 304 stainless steel for durability and a professional appearance. Complete with (4) 12" deep bowls, an 8" backsplash, and (2) 36" drainboards, this pot sink features welded stainless steel cross-bracing on the sides for stability. Advance Tabco 93-4-72-36RL Regaline Four Compartment Stainless Steel Sink with Two Drainboards - 146"
Better - The Advance Tabco 93-4-72-36RL Regaline 146" four compartment pot sink is made of 16 gauge 304 stainless steel for increased durability and a professional appearance. Complete with (4) 12" deep bowls, an 8" backsplash, and (2) 36" drainboards, this pot sink features welded stainless steel cross-bracing on the sides for stability. Advance Tabco 94-4-72-36RL Spec Line Four Compartment Pot Sink with Two Drainboards - 146"
Best - The Advance Tabco 94-4-72-36RL Spec-Line 146" four compartment pot sink is made of 14 gauge 304 stainless steel for enhanced durability and a heavy-duty professional appearance. Complete with (4) 14" deep bowls, an 11" backsplash, and (2) 36" drainboards, this pot sink features welded stainless steel cross-bracing on the front, rear, and sides for increased stability. Advance Tabco 9-64-72 Super Saver Four Compartment Pot Sink - 89"
Good - The Advance Tabco 9-64-72 Super Saver 89" four compartment pot sink is made of 18 gauge 304 stainless steel for durability and a professional appearance. Complete with four 12" deep bowls and 8" backsplash, this pot sink features welded stainless steel cross-bracing on the sides for stability. Advance Tabco 93-64-72 Regaline Four Compartment Stainless Steel Sink - 89"
Better - The Advance Tabco 93-64-72 Regaline 89" four compartment pot sink is made of 16 gauge 304 stainless steel for increased durability and a professional appearance. Complete with four 12" deep bowls and 8" backsplash, this pot sink features welded stainless steel cross-bracing on the sides for stability. Advance Tabco 94-64-72 Spec Line Four Compartment Pot Sink - 89"
Best - The Advance Tabco 94-64-72 Spec-Line 89" four compartment pot sink is made of 14 gauge 304 stainless steel for enhanced durability and a heavy-duty professional appearance. Complete with four 14" deep bowls and 11" backsplash, this pot sink features welded stainless steel cross-bracing on the front, rear, and sides for increased stability. Advance Tabco 9-64-72-18RL Super Saver Four Compartment Pot Sink with Two Drainboards - 118"
Good - The Advance Tabco 9-64-72-18RL Super Saver 118" four compartment pot sink with two drainboards is made of 18 gauge 304 stainless steel for durability and a professional appearance. Complete with four 12" deep bowls and 8" backsplash, this pot sink features welded stainless steel cross-bracing on the sides for stability. Advance Tabco 93-64-72-18RL Regaline Four Compartment Stainless Steel Sink with Two Drainboards - 118"
Better - The Advance Tabco 93-64-72-18RL Regaline 118" four compartment pot sink with two drainboards is made of 16 gauge 304 stainless steel for increased durability and a professional appearance. Complete with four 12" deep bowls and 8" backsplash, this pot sink features welded stainless steel cross-bracing on the sides for stability. 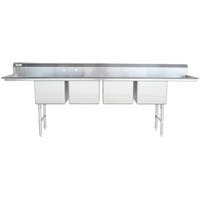 Advance Tabco 94-64-72-18RL Spec Line Four Compartment Pot Sink with Two Drainboards - 118"
Best - The Advance Tabco 94-64-72-18RL Spec-Line 118" four compartment pot sink with two drainboards is made of 14 gauge 304 stainless steel for enhanced durability and a heavy-duty professional appearance. Complete with four 14" deep bowls and 11" backsplash, this pot sink features welded stainless steel cross-bracing on the front, rear, and sides for increased stability.